Many classes of electrophysiological activities of the brain are used in designing various types of brain–computer interfaces (BCIs). Those are discussed briefly in this section. Sensorimotor activity generally corresponds to the behavior of the brain rhythms (mu, beta, and gamma), movement-related potentials (MRPs), etc. Next, the classification of BCI based on various parameters has also been discussed. These parameters are the mode of signal acquisition, timing, and placement of sensors. 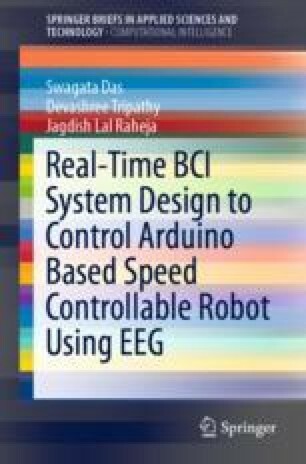 Later in this section, algorithms that have been and with chances of being, used in BCI applications have been discussed in a detailed manner. The algorithms chosen for each stage of the signal processing have an equal role to play in resulting a better outcome. Therefore, the section emphasizes the algorithms for each such stage, separately. Choosing a perfect algorithm is very important to design an efficient classifier. This section provides important information about the algorithms concerned with BCI. Aliki, M., and V. Emmanouel. 2008. Polysomnography: Recent Data on Procedure and Analysis. http://www.pneumon.org/assets/files/Archive/PNEUMON_2008-4.pdf#page=44. Signal, N.B. 2015. NeuroSky, Inc. http://neurosky.com/Year.